Do you have anyone in your life that is just simply amazing, maybe a neighbour, a co-worker, or maybe your daughter's school teacher? Well the card I made for this weeks sketch is just that, Amazing. If you haven't been over to our sketch challenge yet, here is the link to this weeks sketch, #18, where you will also find the inlinkz to link up your creation. I love running this sketch challenge, seeing what our entrants and design team members come up with. It's amazing seeing so many creations from one sketch. I had so much fun making this card. The colours were so bright, and I popped at me. I used the new paper packet Sarita (x7171B) from CTMH, and pulled the colours from the paper. 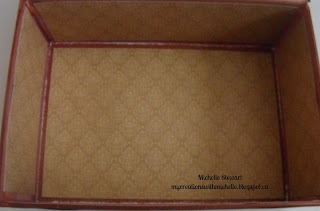 I cut 1" strips 5 3/8" long and then used the new Scallop Border Punch(z1851) to make the scalloped edges. I layered them, using Outdoor Denim, Gypsy, Goldrush and Cotton Candy, used a strip of Sarita, then the top layer of cardstock is Lagoon, and that is cut at 2 1/2" wide. I stamped the sentiment in Black Ink from the Love This Stamp set (B1432), and stamped the flower found on this stamp set 4 times in Archival Ink so that I could colour them with the Alcohol Markers. CTMH Alcohol Markers come in sets of 2, one is the actual colour and the second is either a shade darker or lighter. Using the darker colour first, I coloured where I wanted, then going over the entire flower with the lighter shade. Don't you just love the effect. The flowers are Outdoor Denim, Cotton Candy, Goldrush and Gypsy. 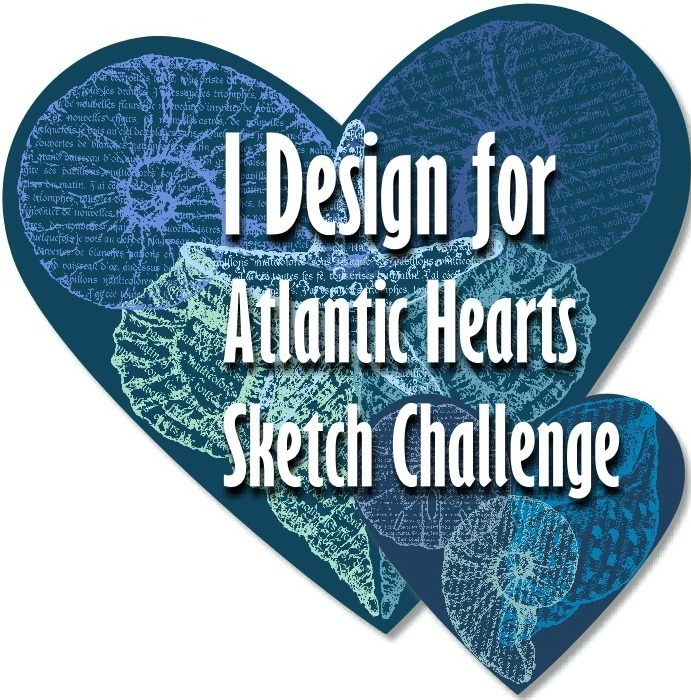 Don't forget to head over to Atlantic Hearts Sketch Challenge to see the Design Teams Creations. You can purchase all these items from my website, or you can contact me to arrange a party where you could earn rewards for FREE product. So on Friday I had a drop-in card class at my home, which was fantastic. Darla, my partner in crime, and myself got to meet 2 members of our Design Team. I'm sure by now you know that Darla and I run the Atlantic Hearts Sketch Challenge. Well 2 of our design team were visiting Nova Scotia on vacation and asked to come to one of our classes. 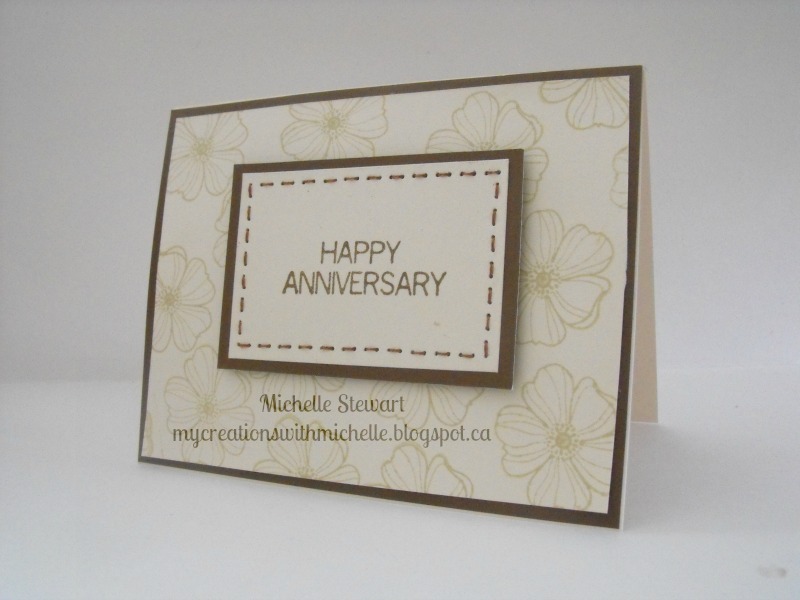 The very first card we decided to make was one I cased from Laura Lee Ryan, using the Happy Autumn Stamp Set(D1550). Well, I got all the pieces out but couldn't find where I had put the stamp. I searched high and how, and had Darla searching too, but we just couldn't find it. So after making 3 or 4 more cards, we gave up the search and decided to improvise. So here is my cased card. It is fabulous, isn't it! Thanks for the inspiration Laura Lee Ryan, but since we couldn't find the missing stamp we grabbed the March Stamp of the Month, Floral Happiness, and a sentiment form the stamp set D1361 Thank You(retired). So, I thought I would do a post to show you that sometimes when you don't have the stamp you want, you can improvise, grab another stamp set that is similar and still create a masterpiece. Oh, and of course not even 20 minutes after finishing this card, I found the missing stamp set. So, incase I haven't told you, when I make the sketches, I base them on how I plan on making my card/scrapbook page, or project. So, my sketches are really just hen scratching that I scan and send to Darla, and she then takes them and digitalizes them. She is my techie guru. Without Darla the AHSC would not be so wonderful. Plus we have a really great design team, who apparently had a difficult time with my sketch; but still managed to come up with some great creations. So for my card I wanted to keep the base of the card one layer, and wanted to add dimension through the embellishments. I started with the Buzz & Bumble Honeycomb pattern paper and stamped the sentiment right on the paper in Cocoa Ink. The sentiment comes from the Stamp Set Special Friendship. 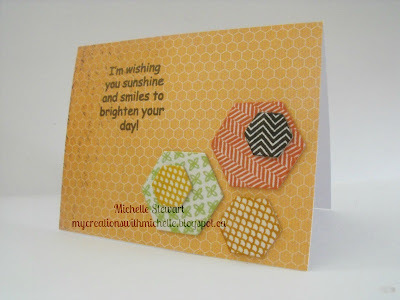 Close To My Heart introduced a new sheet of Irresistibles Dimensional Elements, Hexagons! What I love about these Dimensional Elements are that they have a resist pattern that shows through when covered in ink. The colors used on the Hexagons are Sunset, Honey, Cocoa, Goldrush and Sweet Leaf. So now that you've had the chance to find out how I made my card, you can pop over to AHSC and check out the creations from the Design Team. Please remember to leave comments, we love to hear from you! This linky party theme is Anything Goes. The sponsors are KaDoodle Bug Designs - $15 giftcard, Robin's Nest - $10 giftcard, Cardz TV- Stamp set of choice. The more you link up, the better chance you have to win. Visit Craftin Desert Divas for all the rules and to play along. Wasn't really sure what I wanted to do at first. 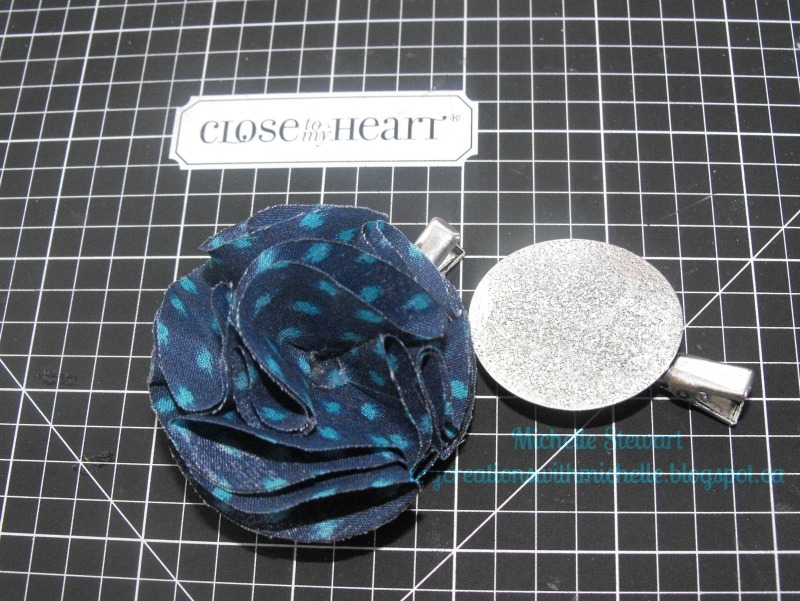 But then I remember that I had received a new order from CTMH and it had the New Base and Bling Hair Clips(Z1875). So that is what I'm going to show you. 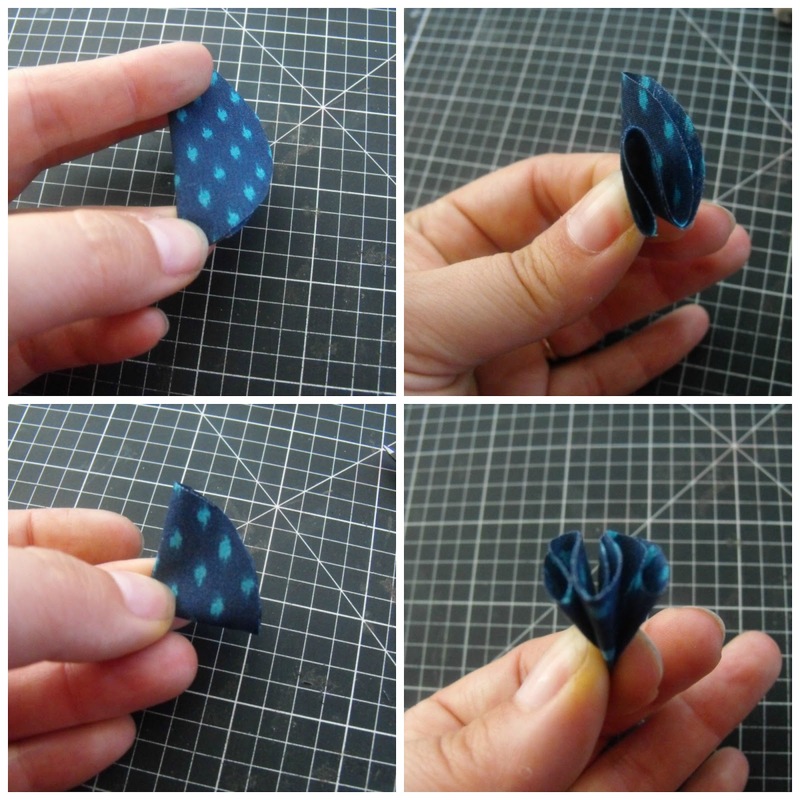 I did a little photo tutorial to show you how to make the flowers. This first photo will show you the finished product sitting next to the base. So, what I did was I chose my fabric, I used the blue panel from the Sarita textile package(Z1885). I made a 2" circle template, which I then traced onto the back of the fabric with a black ink pen. I cut out 9 fabric circles. I used the largest circle adhesive dot from the sheet, there are 4 coordinating sizes to match all the jewellery(Z1903). 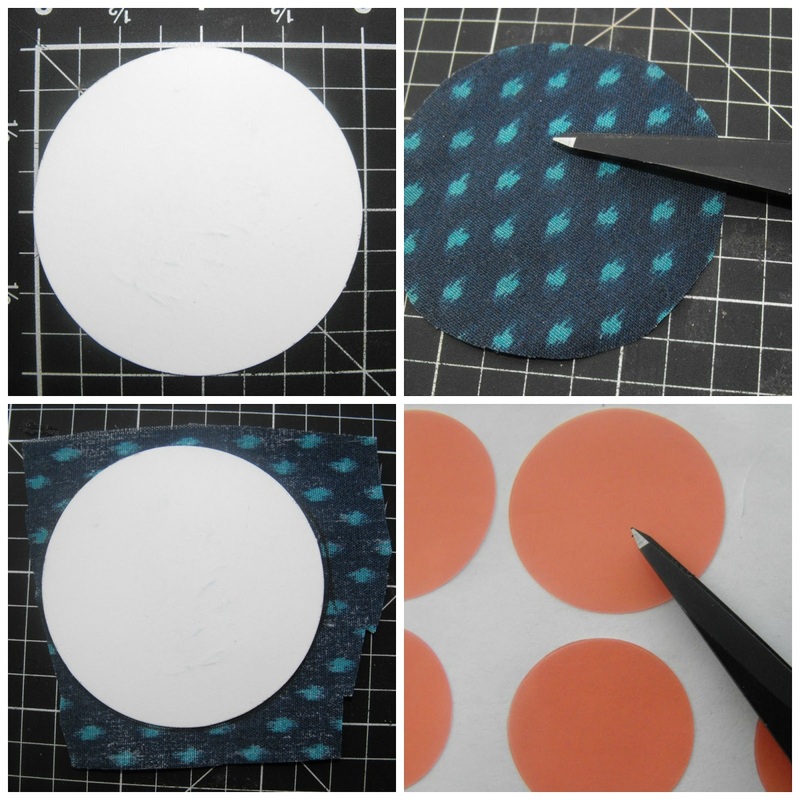 Once all my fabric circles were cut out I took the top piece off the adhesive which is adhered to the hair clip, and I started by folding 1 of the 9 circles and placing it on the base. You fold the circle in half, and then half again, and then I folded each piece back onto itself. I did this 8 times, as it will hold 8 folded pieces around the circle, and then put the last one in the centre to give it a fuller flower. I put each piece on as I finished folding it. 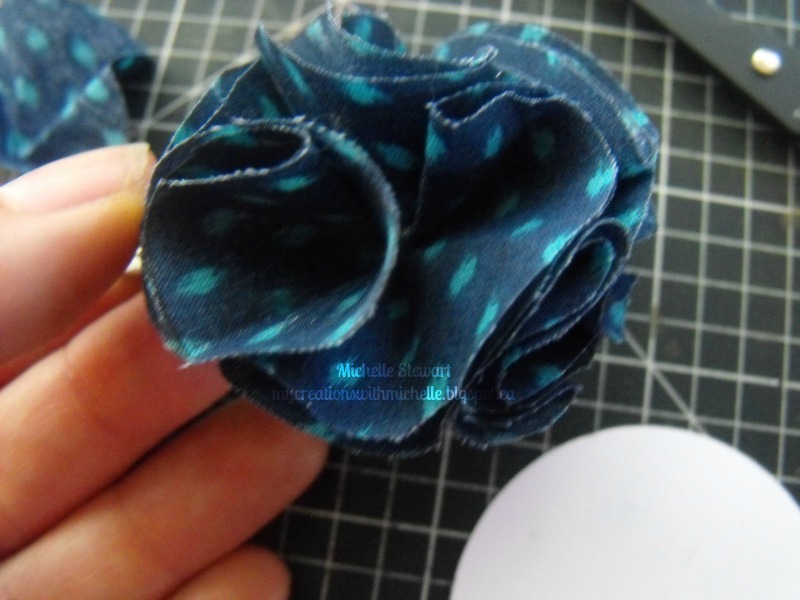 You should have a great flower hair clip, I wanted mine fuller, so for this I needed a glue gun, and I popped a small glob of hot glue in the centre, and placed my ninth piece in place. I then gently separated the folds just a little to fill in the empty spaces. Finally, it is ready to be modelled. 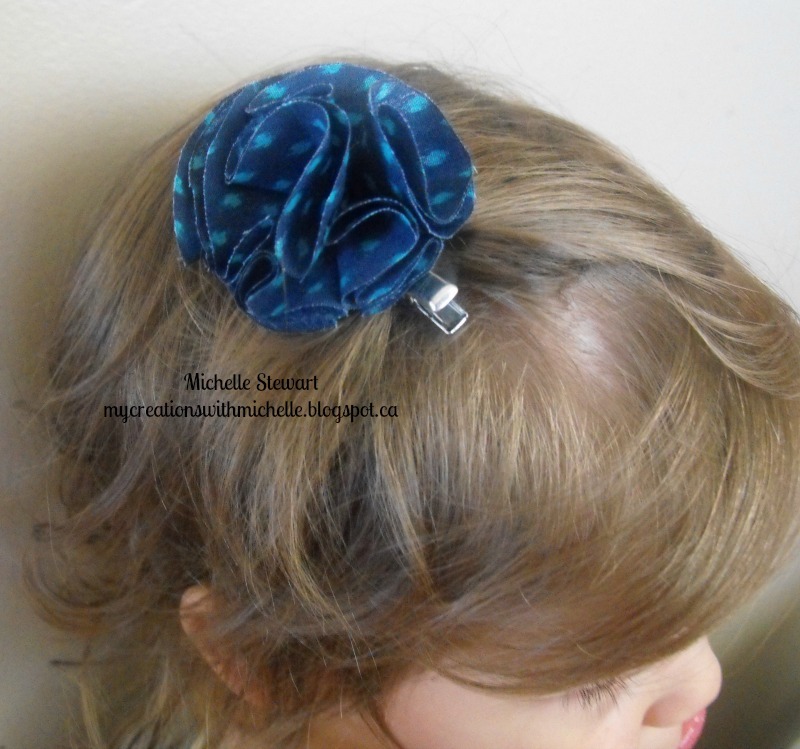 So I grabbed my littlest model and tada, we have a Sarita Hair Clip. 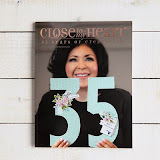 Welcome to our August Blog Hop featuring Close To My Heart Kraft products. 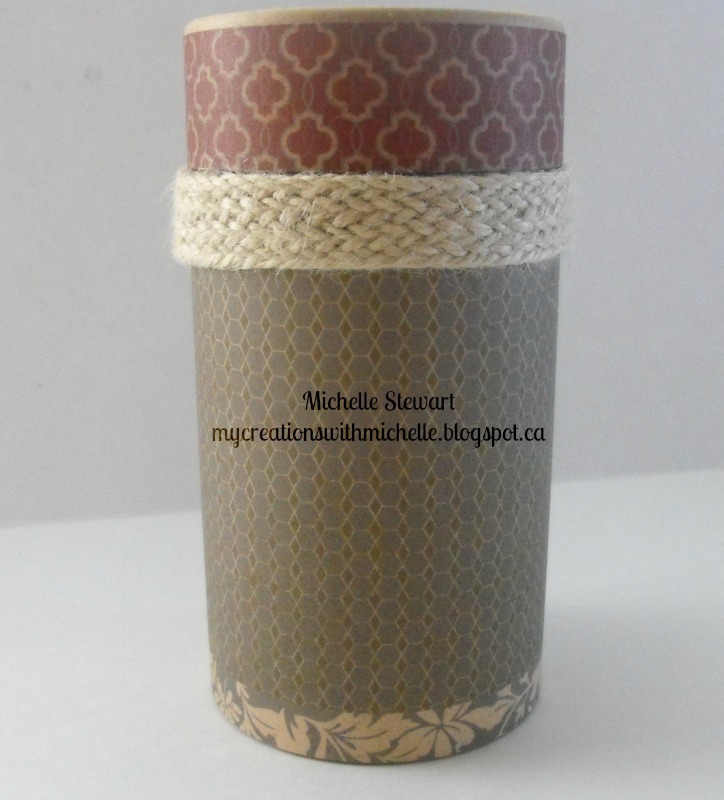 You will see creations from our participants that will include our New Kraft 3 Ring binder, the Kraft Container as well as our Kraft paper and cards. To purchase any of the items seen in our blog hop today, contact your local consultant to place an order. If you have just hopped onto my blog, you can start here as this is a circular hop, plus I'm the first stop on this hop as you hop across the country. For my project, I used the My Creations Kraft Container(Z1833) which is large enough to hold a can of pop, some pens and pencils or some candies, you choose. This container measures 5 3/4" x 3", and is stampable. 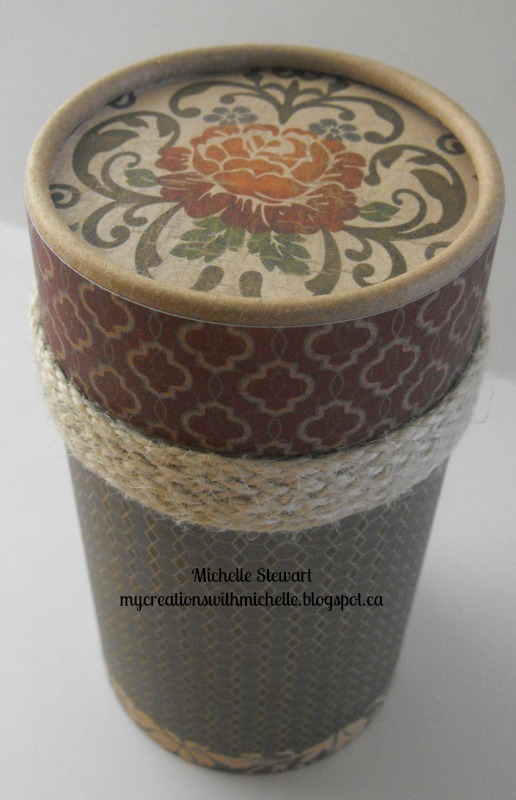 I chose to cover it with the Huntington Paper Packet(X7174B) and the Jute Ribbon(Z1867). For the top of the cover, I was able to cut the circle the exact size I needed on the cricut, and just slid it in under the edges. Terry Ann~It's my garage and I can craft in it! Thanks for hopping along with us - we hope we were able to inspire you to get creative using some of the designs, products and techniques seen along the way. 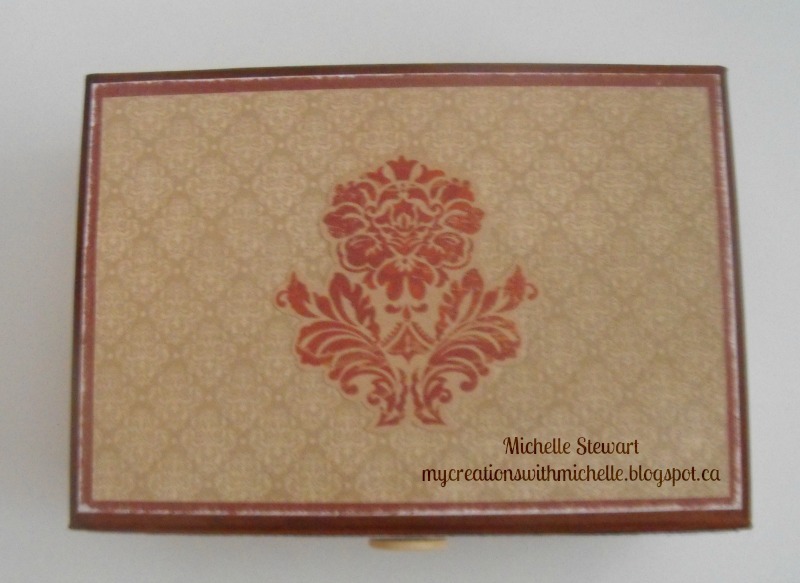 Join us again in September when we will be featuring Jeanette's Archived Stamps. Jeanette has re-released 5 stamps from her archieves. We hope you will join us again on September 15th. 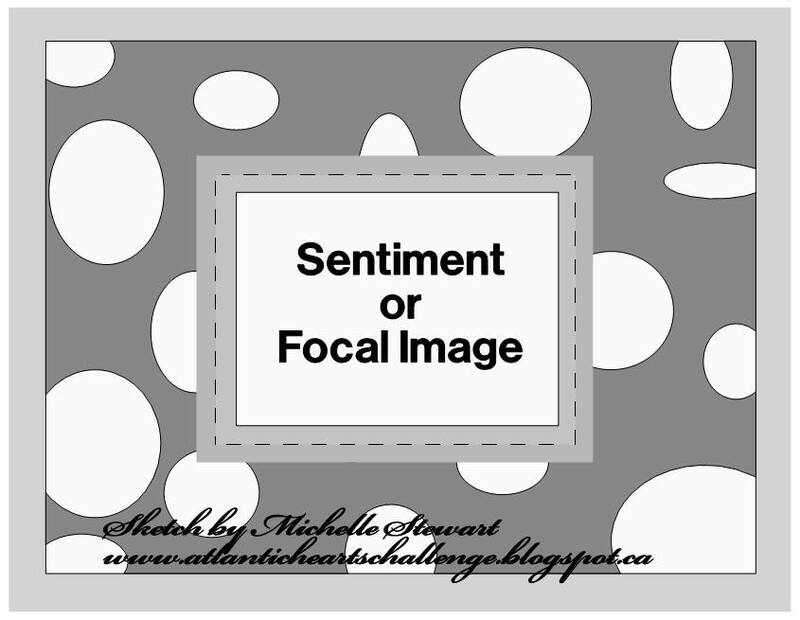 This week over on Atlantich Hearts Sketch Challenge we are on our sixteenth week. We've had entries from Australia, Sweden and the UK. The entrants have been creating some pretty amazing artwork, and sharing it with us on our blog. 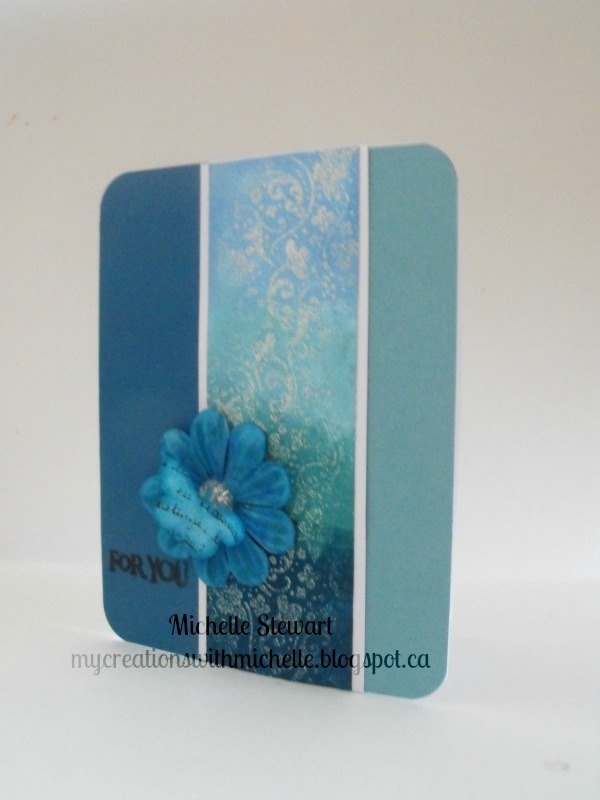 So for my card I started with a white card base and I added a piece of Crystal Blue Cardstock to the first side. Then I added a piece of Pacifica cardstock to the other half. On a piece of White Daisy Cardstock I stamped in Colonial White Pigment Ink using the floral stamp from In the Background, and then heat embossed with clear embossing powder. Then comes the fun part, it is called Resist Enbossing. Using 4 sponge daubers, and starting from the top and working down I inked up over the embossed image. The colors I used are Sky, Crystal Blue, Twilight and Pacifica. So don't forget to check out our entrants as well as our amazing Design Team. 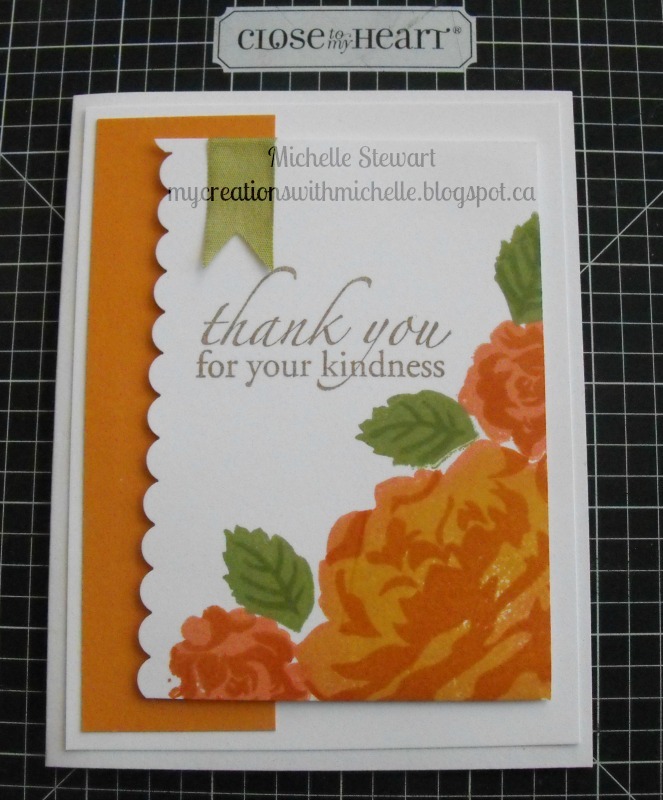 I made this card especially for the challenge over at Color My Heart. We are on Color Dare #55, use Laughing Lola Gold, Blue and Purple. I decided to use CTMH New Spin Cards(Z1866) and some of the Laughing Lola Assortment(Z1854) to finish it off. 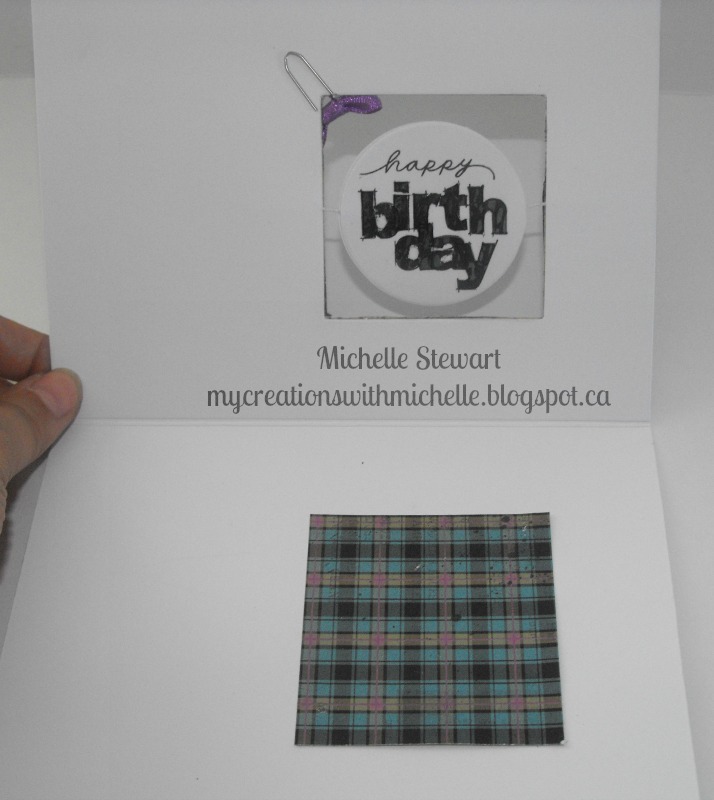 The Plaid paper is cut at 4 3/4" x 6 3/4", and then the Paisley paper is cut at 3 1/2" x 5". The square cut out is 2 1/2" x 2 1/2" and I used that piece to give the sentiment a background. 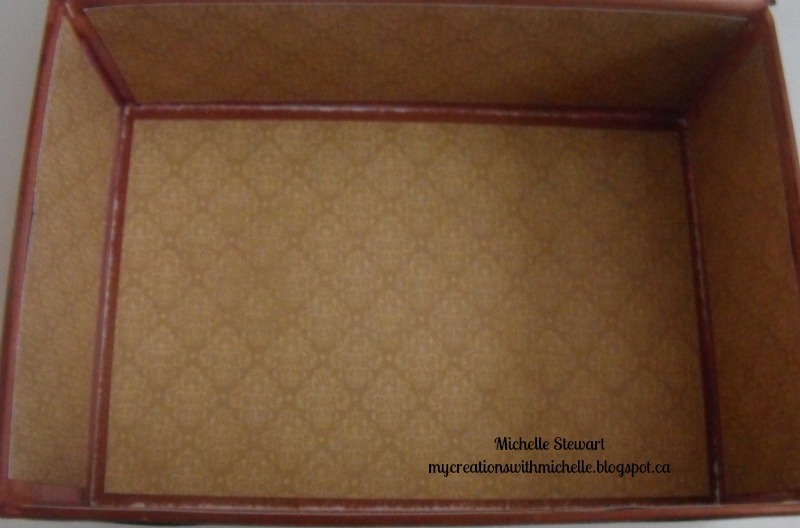 I then used a 3/4" strip of the Snake Print and used our new scallop punch to create the boarder. The happy birthday sentiment is stamped directly on the spinner piece, and then I stamped it a second time on the snake print paper, and trimmed it out. Then paper pieced it onto the spinner. As you can see, when you open the card, the Happy Birthday sentiment spins, so it is on the inside of the card. 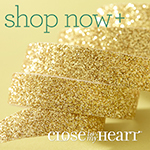 To purchase any of the items I have used here, you can shop here, or with your local consultant. I'm so excited to say that we've got a full rooster on our Atlantic Hearts Design Team, in 5 months from now, we will be starting to recruit for our second round. So if you missed out we would love to see you apply for our Design Team then. I still can't believe that this week marks our 15th week! Yep, this week we are featuring Sketch #15. I really followed my sketch when making this card, following all my little side notes, and it turned out exactly as I planned. I really love this card, and decided it would make a very nice Anniversary card. So, I started with a Colonial White cardbase, the next layer is just slightly smaller then the base, just to show a hint of the cardbase. Then I used the Flower stamp from Card Word Puzzle and stamped it in Bamboo Ink on Colonial White CS. To get the random pattern, you stamp in sets of 3 making a triangle. Then I cut another piece of Chocolate CS and Colonial White CS for my sentiment. I stamped the sentiment in Chocolate Ink from the From Me to You stamp set. Then I stitched around the edges using Chocolate Embroidery Floss. Make sure when you adhere the pieces together not to put your adhesive where you plan on stitching as it will gum up you piercer and needle. Now don't forget to hop on over to Atlantic Hearts Sketch Challenge and check out the awesome artwork our design team has created. 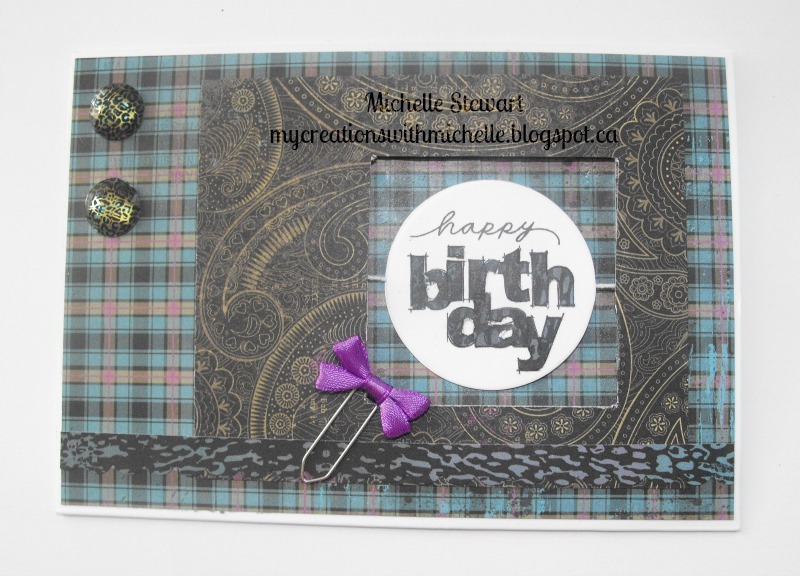 For this card I used a pattern from the Make It From Your Heart Vol II. This is Pattern #20. I turned it on it's side. 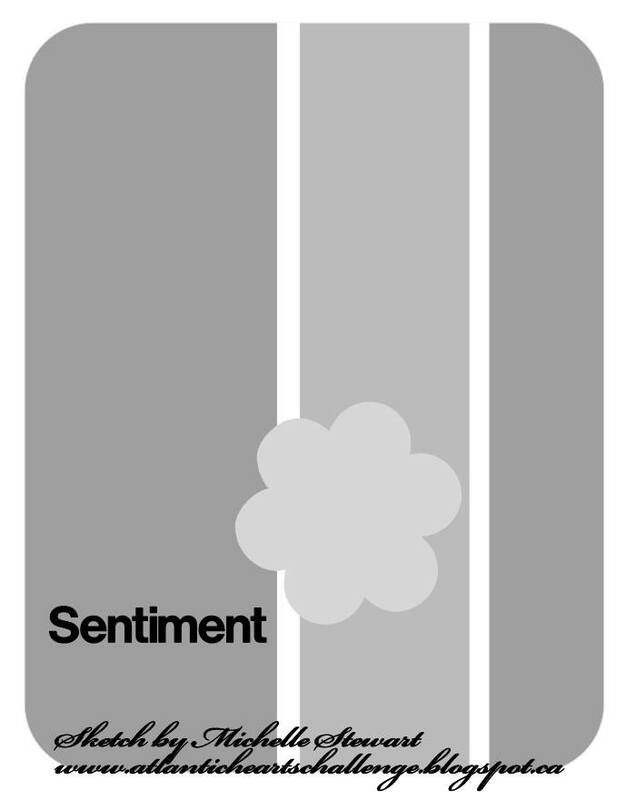 I also added a piece of Champagne CS for the sentiment. 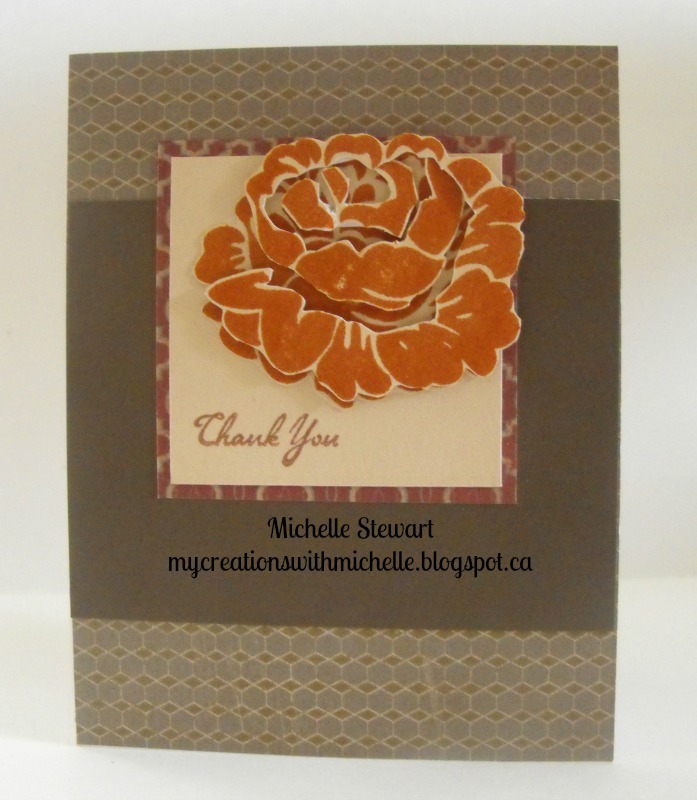 I used the smaller flower stamp from Happy Autumn(D1550) give a background, it is stamped in 2nd generation Desert Sand. 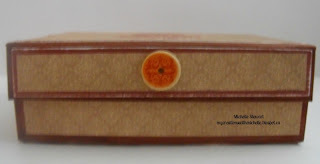 The sentiment also comes from this stamp set, and is stamped in Autumn Terracotta. I distressed al the papers using a sponge and chocolate ink. For my second card, I used another pattern from the new How To Guide. This is pattern #24. 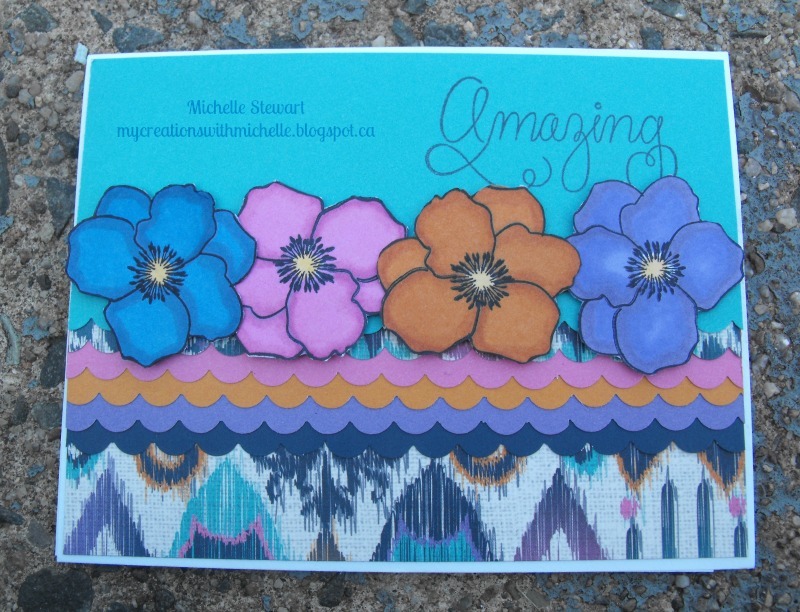 I used 2 stamp sets to make this card. The sentiment is stamped in Barn Red, and is from Pefect Fit-Thanksgiving(B1427). Then I stamped the flower image form Happy Autumn(D1550) two times on scrap paper and fuzzy cut them out. I Adhered the first directly to the card. The second one, I cut out pieces from sections of the flower, and then added 3D foam tape to pop it off the first flower.I didn't place it over the first exactly, I overlapped them just a bit, so you can see the flower below. My final card today also is from a pattern in the new How To Guide. This is pattern #21, and once I had all my squares, I then cut them diagonally to make triangles. Then carefully I started to place them onto the piece of Cocoa CS. I sanded the edges of the Cocoa to sort of give it that vintage vibe. 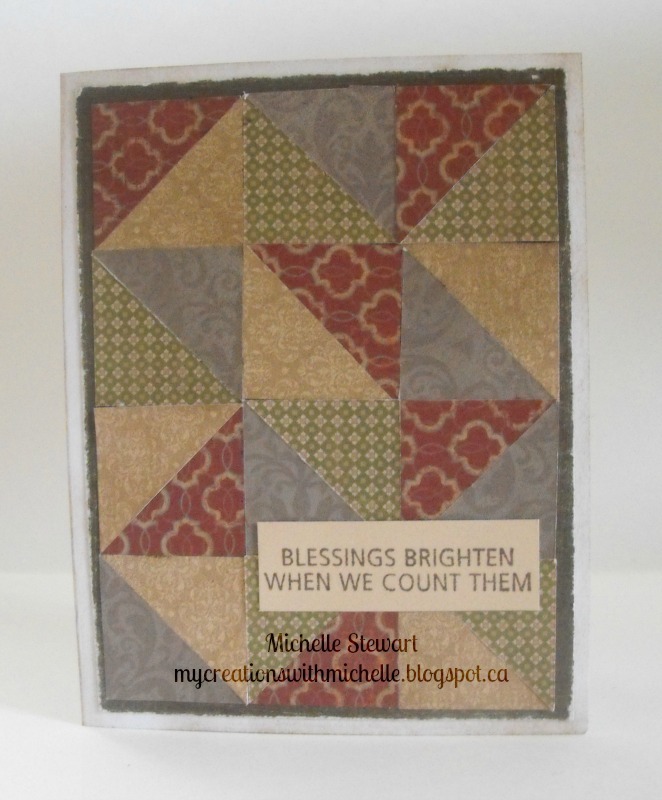 The sentiment is from the Stamp Set Count Your Blessings(C1555), and is stamped in Cocoa ink. 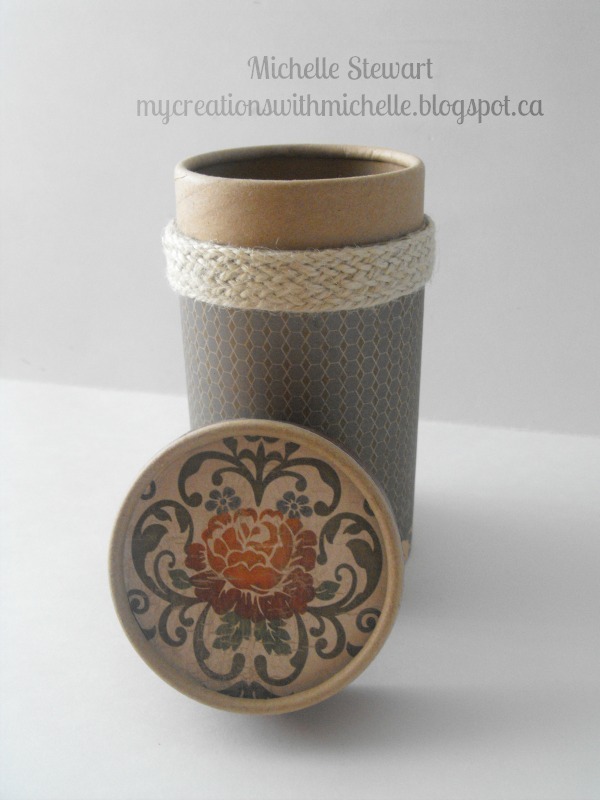 You can find the card box here, this link will return you to the Blog hop featuring many fabulous projects. 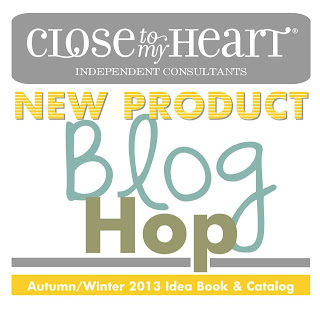 I am so excited to be able to tell you today is the day you can view the New Idea Book for Autumn/Winter online. If you would like to receive a copy of the book please email me, and I will get one out to you. 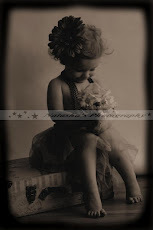 There are so many wonderful New Items and I wanted to create some projects to show you. I really like the New Huntington Paper Packet(X7174B), and decided with Autumn only a month away that I would use that for today's preview. Along with the paper I used the Huntington Stickease(X7174C) and the Huntington Assortment (Z1881) to create this super cute and easy Card Box(Z1647). The great thing about making this card box is that I used less than 2 sheets of paper. 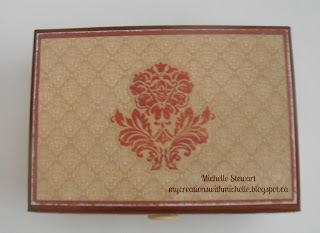 I used about 3/4 of a sheet of Barn Red Cardstock, and 5/6 of a sheet of the Champagne/Cashmere patterned paper. That leaves me with 5 sheets of Cardstock and 5 sheets of patterned paper that I can make cards with. 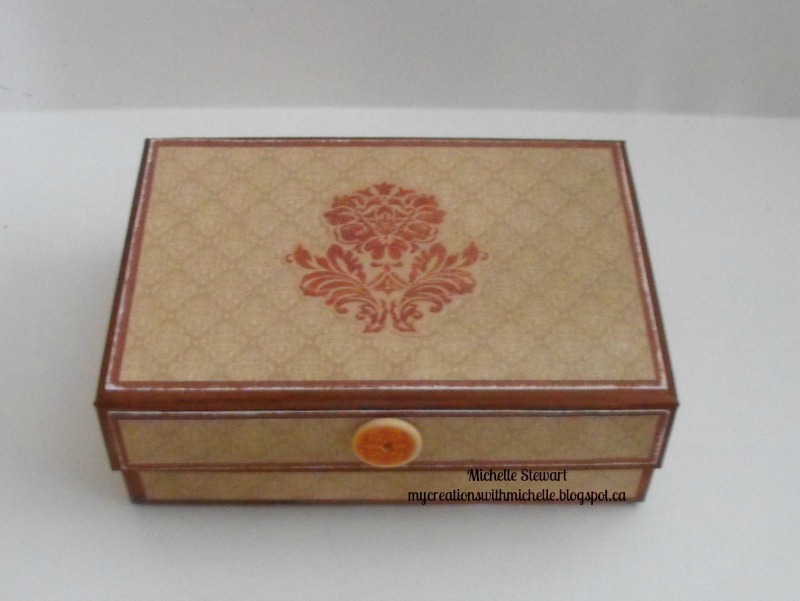 Check back in the next 3 days on my blog and I will have cards made to accompany this card box. So for this card box, I firstly started by inking all the edges, inside and out with reinker and the areas that need a touch up and I went back in with a marker. The colour used is Barn Red. While that dried, I started by cutting my papers. I only needed 2 sheets of paper for this project. A sheet of Barn Red cardstock. Once I had the pieces cut I sanded all the edges to bring out the white core. Then I cut all my pieces of Cashmere/Champagne Patterned Paper. Once the box was dry I started adhering the paper to the box. On the top of the box, I added one of the stickease from the collection, as I wanted to keep this a very simple design. Then I added one of the bottons from the collections Assortment to the flap. I think it just gives it that finished look. I also covered the inside of the box, which is why I also had inked the inside. My hubby liked it and tried to claim it as his cigar box. Now don't forget to hop through and check everyone else's projects. 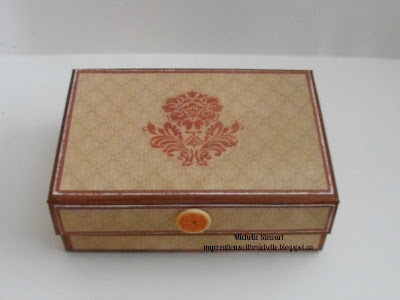 And come on back and check out my collection of cards in the next few days that will coordinate with this box.